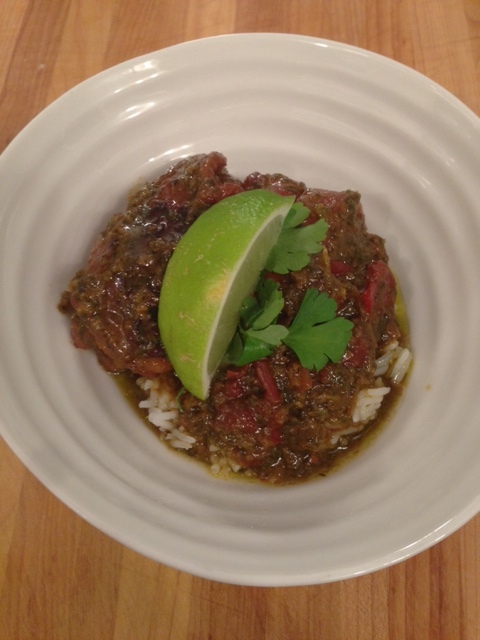 Trinidad-Style Chicken Stew | So Hungary! I was on a plane yesterday watching the Food Network, and Roger Mooking of Everyday Exotic made this amazing looking chicken stew. I was salivating for half an hour over this meal, and when I got home decided this must be our dinner for the day! As you can tell, we love soups and stews, especially in the winter. This Trinidad-style chicken stew has so much flavor from simple ingredients, and is actually really easy to throw together. There is a marinade that you will make first, and you can marinade your chicken anywhere from 30 minutes to 24 hours! I only did 30 minutes as I only found the recipe on the airplane that morning, but next time would extend the marinating time if possible. The recipe calls for plantain banana – I have never cooked with this before! I was a bit nervous to use this ingredient as I really had no experience with it, and honestly have never tried it before so I was unsure of how it would taste. If you are the same, do not fear! Plantains taste completely different than a regular banana, and have a different texture. The best way I can describe it in this recipe is like a potato, but with a hint of sweetness. I hope you enjoy this recipe as much as we did and try something new! Place all above ingredients in a blender or food processor. Blend until you have a semi-smooth puree. Do not add more than 1/2 cup of olive oil or your dish will have too much. Place the chicken in a bowl with half of your Amise marinade. Mix well, cover and let sit for 30 minutes – 24 hours. In a wide-based, high edged pan on medium-high heat, add the sugar and vegetable oil. Make sure to watch this closely, and stir often for about 5-7 minutes until your sugar is brown and caramelized. Add the chicken into the pan skin-side down. Brown each side for 2-3 minutes. At this point you will add your onion, chili pepper, plantain and tomatoes to the pan. Give all your ingredients a good stir and let them saute for a couple of minutes. Add your Worcestershire sauce and chicken stock to the pan. Bring everything to a boil, season with salt and pepper and reduce the head to medium-low. Cook for 30 to 40 minutes and you are done! This was delicious served over a bed of rice, topped with fresh parsley and a squeeze of lime.